Location: Mainland Orkneys, Scotland. Grid Reference: 58° 59' 39.17" N. 3° 12' 22.23" W.
Stones of Stennes: (Henge Circle). 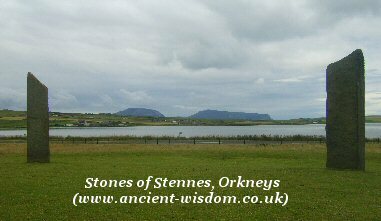 Very little is left now of the Stennes circle, but the remaining few stones offer a tantalising glimpse at the way the monument would have looked when all 12 stones were originally present. The size and straight edges of the stones gives this circle a look and feel unlike any other in the world. 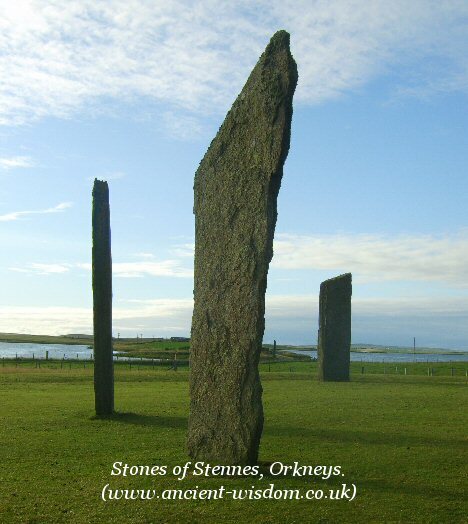 The Stones still stand over 5m tall, with the Hills of Hoy in the background. 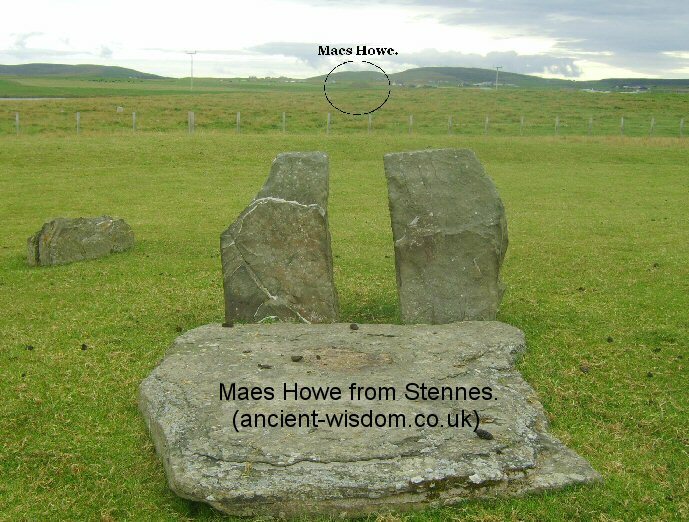 Both the Ring of Brodgar and Maes Howe are easily visible from Stennes, reminding one that they are only a small part of a larger, ceremonial arena which connected the megaliths with the landscape, in a way rarely visible today. There are only four remaining stones today, but when the site was excavated by Grahame Richie in 1973, he found the sockets for 12 stones. In the centre of the stone circle there was a square stone structure, flush with the ground, at the entrance of which Ritchie found the remains of a pair of standing stones. Radiocarbon dating of the ditch produced a date of 3,040 BC. The deep-cut ditch which surrounds the stones was cut 2 metres down into rock requiring the removal of 18,000 cubic metres of rock. (16). Thousands of man-hours must have been devoted to hewing the 2m (6 ft 6 in) deep and 7 m (23 ft) wide ditch from 1250 tons of solid sandstone bedrock. but the ditch and outer bank are now almost disappeared; the three stones of the cove were reconstructed on 1906. Actually, the cove has been 'restored' using some fallen stones to form what was then mistakenly thought to have been their original formation. 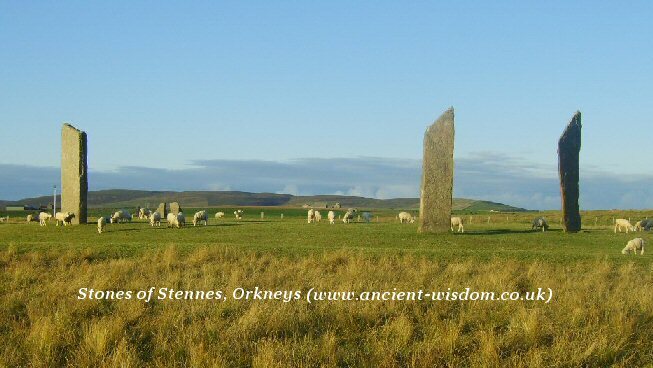 The Stennes circle originally had a diameter of 31.7m (104 ft) and a total of 12 stones; the tallest is about 5 m (16 ft) high, but not far away at the mouth of the causeway, is an even taller stone of 5.6m (18.5 ft) high and known as the 'Watch-Stone'. 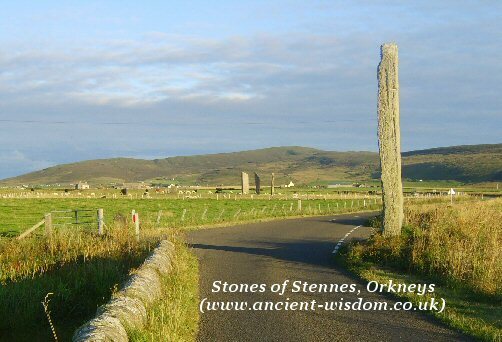 Stennes Stones from the Causeway with remaining Watchstone in foreground. Current archaeology is revealing the presence of a large complex along this causeway (The Ness of Brodgar), uniting, at the same time as separating the Stones of Stenness and the nearby Ring of Brodgar. The landscape has been compared to the prehistoric landscape around Stonehenge, acting as a symbolic and physical gateway between the living world and the land of the dead. View from Stennes across the Causeway. 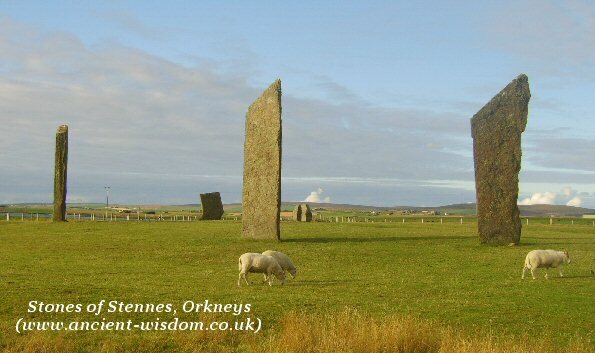 Tradition: According to Dr. Robert Henry, an 18th century antiquary, the site was once known as the Temple of the Moon, and the Ring of Brodgar as the Temple of the Sun. There are stories of couples going first to the Temple of the Moon, where the woman fell down on her knees and prayed for strength, and then going to the Temple of the Sun where the man did the same. Each New Year's Day, the local people met at Stennes church and danced and feasted for several days.